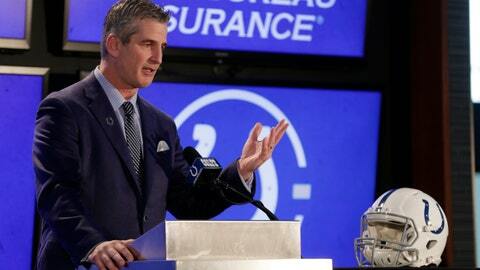 Frank Reich speaks to reporters at his introductory press conference. While general manager Chris Ballard acknowledged making a mistake by not including Reich on his original shortlist, Irsay went even further after former team president Bill Polian, former coach Tony Dungy and Peyton Manning all called with glowing endorsements about Reich. The result of going “dark” during both postseason bye weeks: Reich won a Super Bowl as the Eagles’ offensive coordinator and got the dream job from a team that gave him his first coaching break in 2006 as an intern. Reich also met with the three assistant coaches hired for McDaniels’ staff and said he was impressed as much with them as he was by the Colts’ commitment to honor their contracts. He did not drop hints about any other hires though he did say he intends to call plays — something he did not do in Philadelphia.